you with food there.' "
Under the influence of Queen Jezebel, Ahab and Israel began to serve and worship Baal. 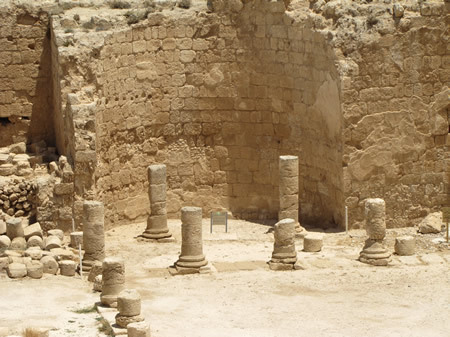 Ahab built a temple in the city of Samaria for Baal and set up an altar. 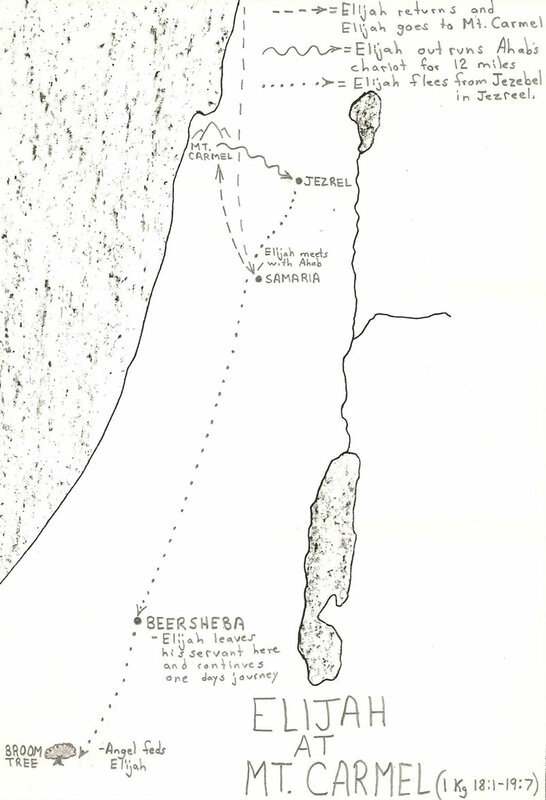 Ahab also set up an Asherah pole. The worship of Baal was a Canaanite practice that followed the seasons and focused on productivity of crops and the fertility of the people. Baal was the god of the storm. 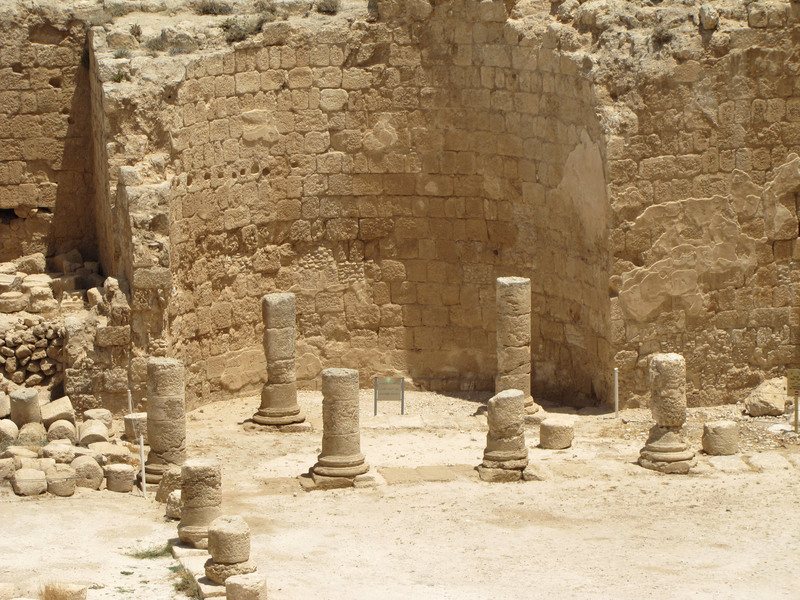 Since fresh rain water was a necessity for the success of agriculture and the survival of a community, Israel followed the Canaanites into Baal worship. According to Canaanite theology, Baal could be awakened and empowered in his struggle against the opposing forces through rituals which included sacred prostitution. The Israelites were swayed by the influence of Baal worshippers to minimize their Lord YHWH as the God of certain powers that might include things like war or the wilderness, and they could easily make room for the god such as Baal who could bring rain and productivity. Asherah was the female consort of Baal. She was represented by a carved pole or tree trunk that was often draped with material and set up near the altar of Baal. This, of course, seemed like a ridiculous statement to the faithful followers of Baal and it was dismissed as ludicrous. But, after three years of no rain, the Baal crowd was in a panic as the whole country searched for Elijah, and Ahab offered rewards for his capture. Elijah eventually meets Ahab and all of his Baal prophets on Mt. 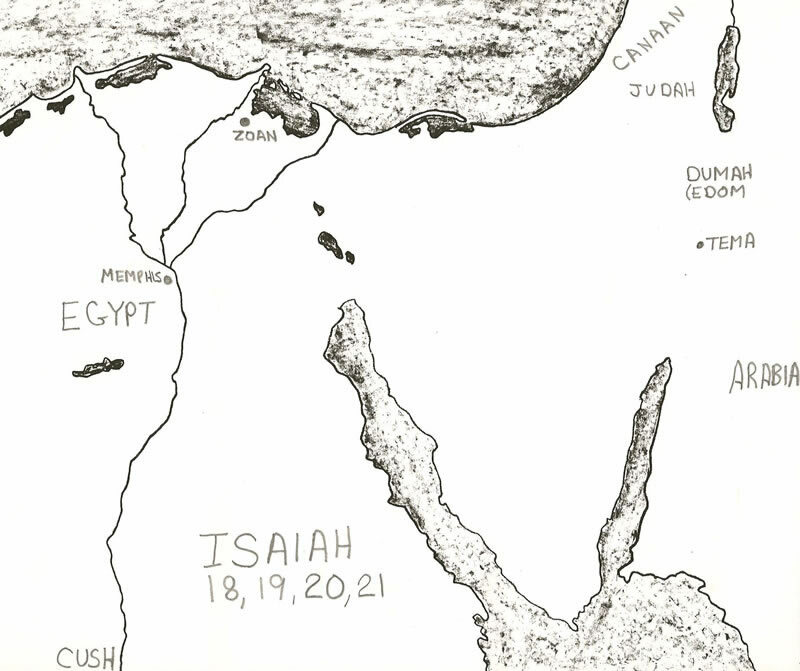 Carmel (map HERE) for a dramatic showdown between the rain god, Baal, and the Lord God, YHWH. The prophets of Baal and Elijah each build an altar to their God with a large crowd of Israelites watching. After hours of crying out to Baal and attempting to get his attention through self-mutilation the prophets of Baal cannot physically continue. 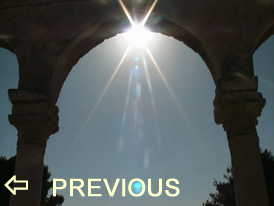 Elijah turns from mocking them to praying and asking the Lord to answer by sending fire to his altar. God responds with a glorious demonstration of power for the Baal infested audience. Elijah slays the prophets of Baal and then for good measure turns to pray for rain. 1- Attitude (Jm.4:6;1 Pt.5:5)-Arrogance or Humility; Self-centered or Christ-centered. Actions are right or wrong. 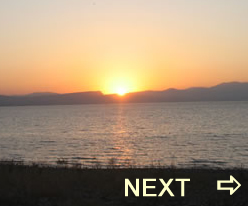 5- Results (Gn.4:7; Gal.6:7-8) - Actions produce results that are blessings or curses. If you want to change your life you have to go back and change your attitude. 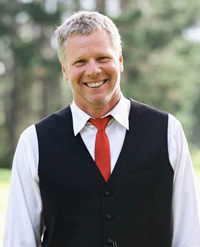 Rob (Hb) – Multitude (Eng) – rob is the Hebrew word that means “multitude,” “abundance,” “large,” “prestigious,” “powerful.” In Genesis 16:10 rob refers to the many descendants of Hagar’s son Ishmael. In Genesis 27:28 rob is used to refer to an “abundance” of grain and wine. Overall rob is used 150x. The Isaiah Scroll found with the Dead Sea Scrolls was copied in 100 BC by a scribe who did not believe there were two authors writing two separate parts of the book of Isaiah since there is no break made by the copyist in 100 BC at chapter 39 like many modern critics try to propose. I will seek God in prayer and seek his wisdom for my basic needs. I will not seek answers in pagan practices or solve problems by walking in ways of unrighteousness. 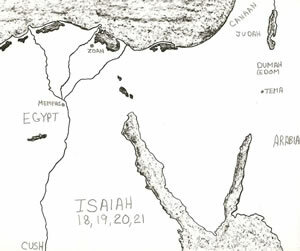 Details of Isaiah 18-21 located on a map.